en el nombre de la patria! ¡Toda su fuerza yace ahí, toda hombría, toda gloria! ¡Vivan alegres argentinos! ¡Viva la alegre patria! - Let the argentines integrate themselves in the name of their nation. There lies their all strength, manliness and glory. Stand up and be united to manifest your boldness. We are fearless. We are united in the name of the blessed country. 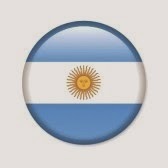 Rejoice argentines and joyful Argentina!